These armwarmers are inspired by my favorite kind of weekend: The kind where I have no plans and nowhere to go. Soft, cozy and oversized, these armwarmers are what I would want to wear on a chilly Saturday afternoon while knitting in my favorite chair. Knitting these armwarmers is going to be like reading your favorite book for the third time. Simple stockinette in the round, a few inches of ribbing, a few increases, decreases, and just the slight complication of the thumb hole make this a relaxing knit. The two-color pattern allows for fun customization, too! Show off your own style with a unique color combo. 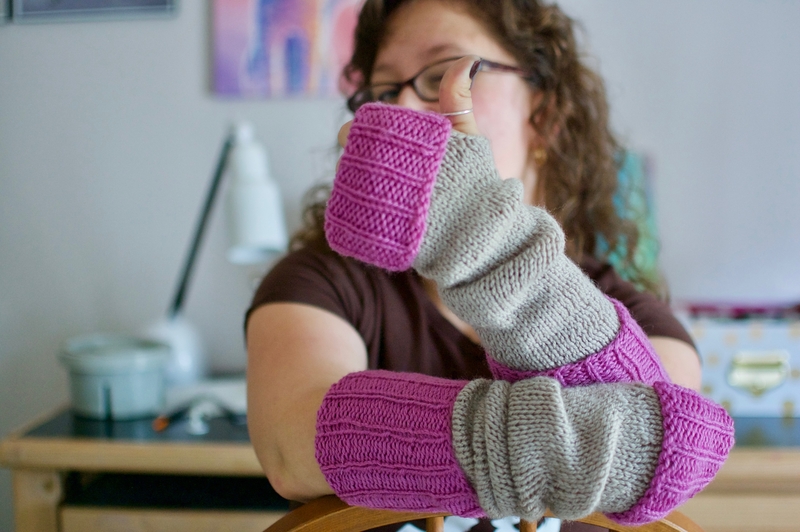 Just sign up with your email address below and I’ll send you my Saturday Afternoon Armwarmers pattern for free!